Seated, from left: Jamie Owens, Tricia Lavender, Sara Peebles, Elaine Clark, Mayor Marva Gipson, Linda Colvin, Carol McKinzey, Debbie Gentry. Standing, from left: Johnie McKinzey, Brenda Coshatt, Carol Jo Hagerman, Brenda Bailey, Beth Powell, Sallie Alston, Sandra Kuykendall, Jane Gwinn, Mary Tucker, Weezie Noland, Kathy Colvin, Connie Johnston, Jean McBride, Jo Anne Young, and Pat Wilson. 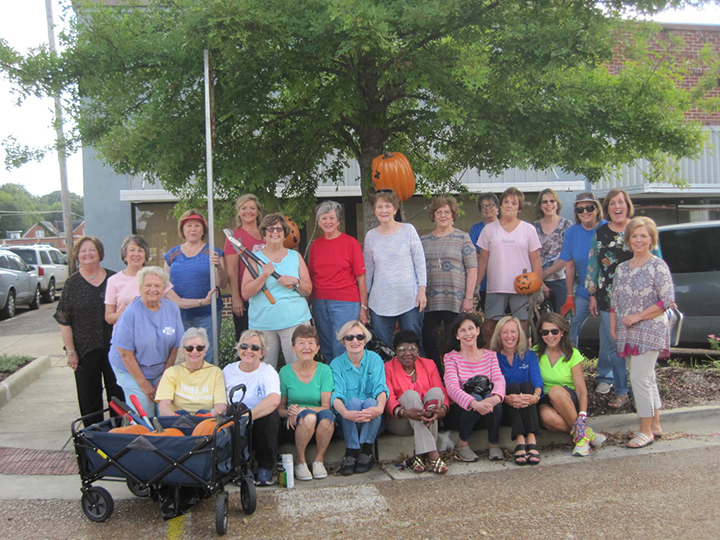 Tuesday, October 9, 2018, Aliceville Gardeners decorated Broad Street with pumpkin people, pumpkins, mums, and hay bales to prepare for the Aliceville Street Fair that was held Saturday, October 20. The club is grateful for the generous financial support provided by the City of Aliceville and Chamber of Commerce, the hay bales donated by Jeff McClure, and set-up and labor provided by Hubert Colvin, Donnie Sanders, Joe Collins, and Dr. Jim Gentry.